SKU: BIO X 3D. Categories: Cellink, Governmental Research, Universities. BIO X is the most user friendly yet flexible bioprinter in the world, providing the user with an unparalleled bioprinting experience. The builtin features along with the new BIO X software managed through the large touch screen display minimizes the learning curve, increases effectively, and ensure you will receive the results you want. 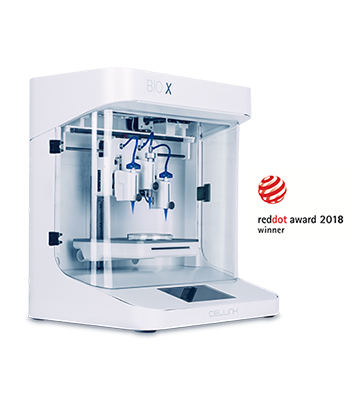 BIO X is the new go-to bioprinter for life science companies, researchers and innovators around the world. 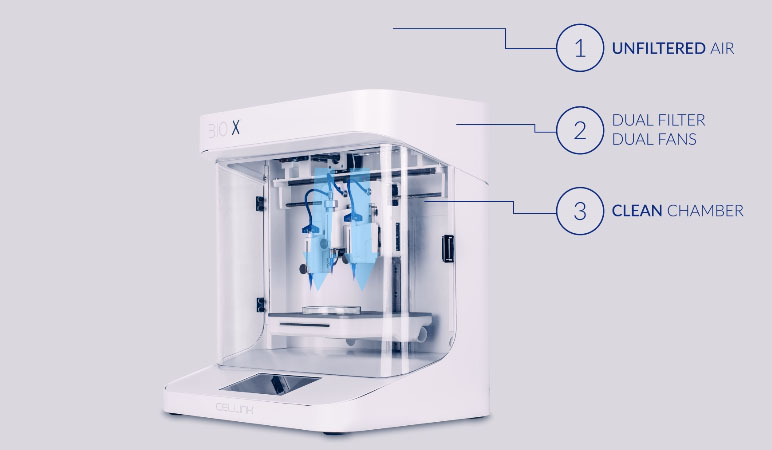 BIO X is the mosuser friendly bioprinter on the market and a comlete standalone product. 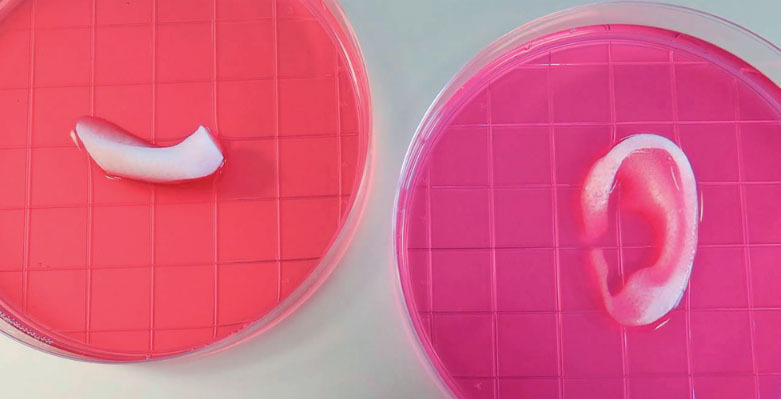 Bioprinted tissue can be used in drug discovery where researchers can test new potential treatments and evaluate efficacy in very early stages. New drugs and treatments will potentially reach clinical trials faster with a decreased number of failures and reduce need of animal testing. 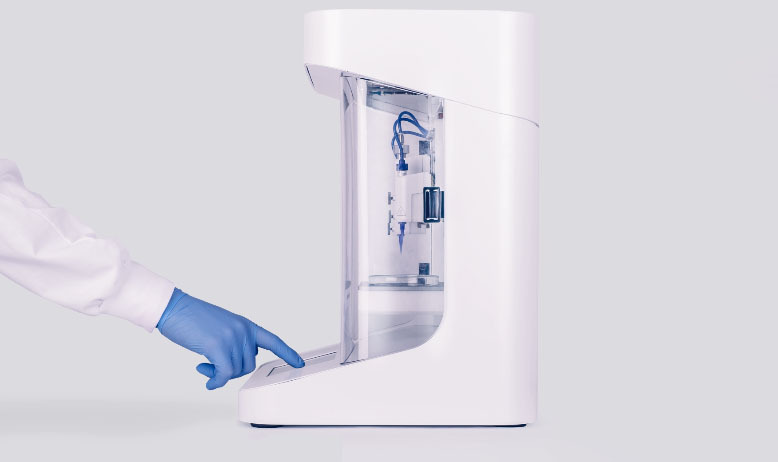 BIO X is the next generation bioprinter, bringing scientists yet closer and faster to a desired future of medicine. With dual, high-power fans producing a powerful airflow through its dual filtration top, the BIO X 3d bioprinter creates a positive pressure inside the chamber. The HEPA H14 dual filter top makes sure that more than 99.995% of unwanted particles and microorganisms are retained. BIO X is equipped with UV-C germicidal lamps that allow you to run sterilization cycles to sterilize the printing environment. Your convenience is our priority. The BIO X touch display is fully usable even while you’re wearing gloves, facilitating the keeping of a clean environment. BIO X and its screen are durable like any lab equipment and can thus be cleaned as such. BIO X is the first 3d bioprinter in the world with Intelligent Print Heads (iPH), ensuring your research is always on the cutting edge. The BIO X print heads are specifically designed with flexibility, beauty, and simplicity in mind. The best part is that you can design your own dispensing technologies or methods and utilize them with the BIO X system. The possbilities are endless, giving you full freedom in your lab work. Utilize the triple print head technology provided by BIO X to combine different materials and printing techniques to fit your application. – Photo Curing Tool Head, for UV light in any wavelength. Collaboration is the key to success. If you don’t find the tool head you need, just let us know! 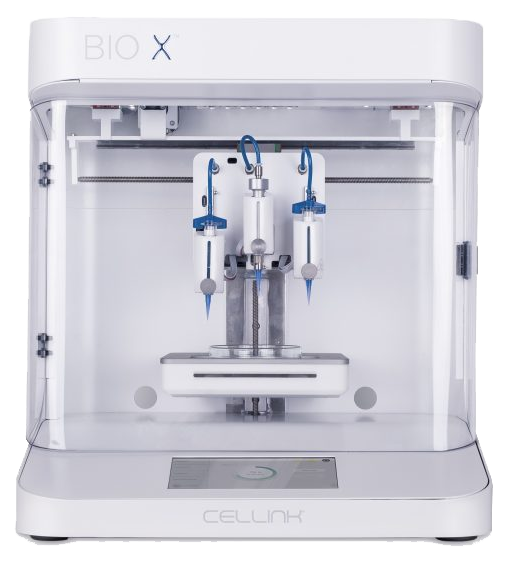 Contact us at info@cellink.com and we will be more than happy to assist you with all of your needs, right here at the world of bioprinting. BIO X allows you to delicately control the temperature of its printbed, which enables a new level of printing quality. 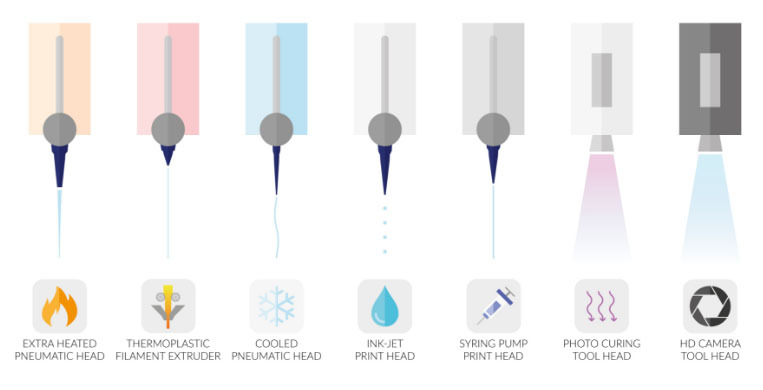 Being able to control the printbed temperature paves the way for the use of any bioink, no matter its viscosity. The INKREDIBLE 3D Bioprinter allows you to print human tissue right in front of your eyes. 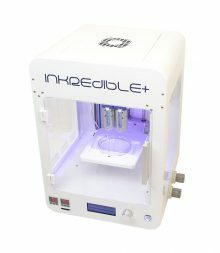 The INKREDIBLE bioprinter offers excellent accuracy, high reproducibility, and ease of use. The INKREDIBLE Bioprinter has been optimized to print Skin and Cartilage tissue, however, the sky is the limit on what tissues you can print. The world is waiting to see what you will print next.